As temperatures plummet, the days become shorter, and the snow starts to fall from the seemingly-glitter filled sky, the Grand Canyon slows with almost a respect for Mother Nature’s transitioning beauty. Many refer to the winter months as the “Secret Season” or “Nature’s Best Kept Secret” at the national park. While the phrase “dead of winter” is used to describe many locations throughout the United States and the “stand still” that they experience, the Grand Canyon is not only bursting with life, but also with activity. If you truly want to harness the sheer power and amazement of the national park, there is no better time for mesmerizing scenery than in the winter, and by helicopter. Two of the most monumental events that transpire at the Grand Canyon during the winter months are directly related to the spectacular sun in the tranquil winter sky – the sunrise and the sunset. The sun sits lower during the cold season, which allows its warm and inviting glow to cascade carelessly among the crevasses, peaks, and other rocky formations throughout the national park. It is during the winter that the skies have the highest level of visibility. As a result, there are many photo opportunities available. As the sun rises up behind the mountains, it will light up over 200 miles of space that you cannot normally see. As it descends in its tuck behind those mountains, the sky and park will dazzle with captivating colors like you have never witnessed. Both by land and in air, observing a sunrise or sunset during winter will leave you in awe of the park’s bountiful beauty. While visiting the Grand Canyon in the winter, you will find that the gently-falling snow seems to sparkle and glisten in a gorgeous – yet soft – manner. With the backdrop of all of those rock formations and the colors of the bright, vibrant winter sky, you will be captivated by the profound beauty and appeal of the fresh snow. When walking on the snow-filled trails, you will feel as if you have truly discovered the tantalizing and breathtaking “Winter Wonderland” that you have heard about and sang about throughout your life. When viewing the snowy cliffs and mountains from the air by helicopter, you are sure to find yourself struck by the immense span of pure white snow that blankets across the national park. While it is possible to observe wildlife at the Grand Canyon at any time throughout the year, these creatures often blend in with their surroundings. During the winter months, they are starkly noticeable against the soft, white blanket of snow that rests upon the ground. 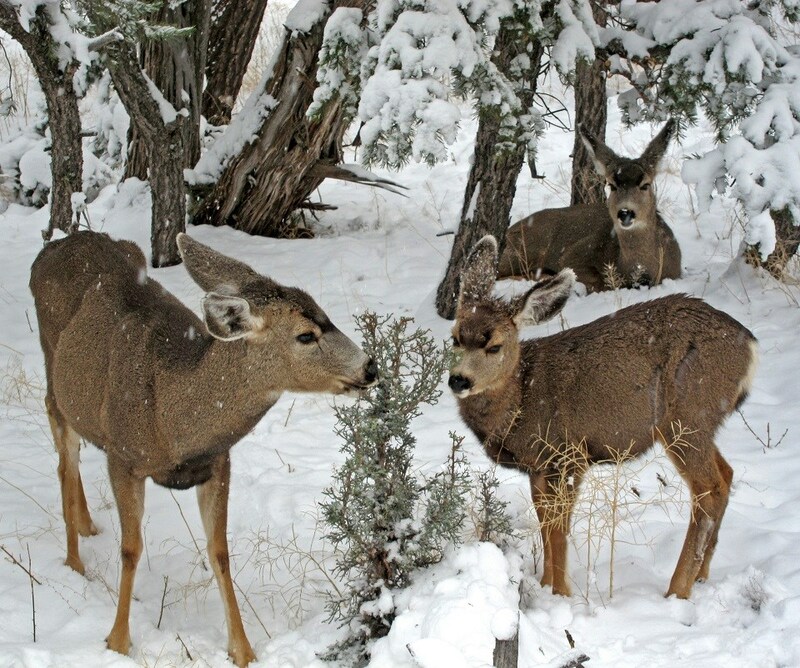 You will be able to observe black ravens gliding throughout the sky, mule deer searching for food, rock squirrels quickly moving from one area to the next, and a vast amount of various other animals scurrying and running about. 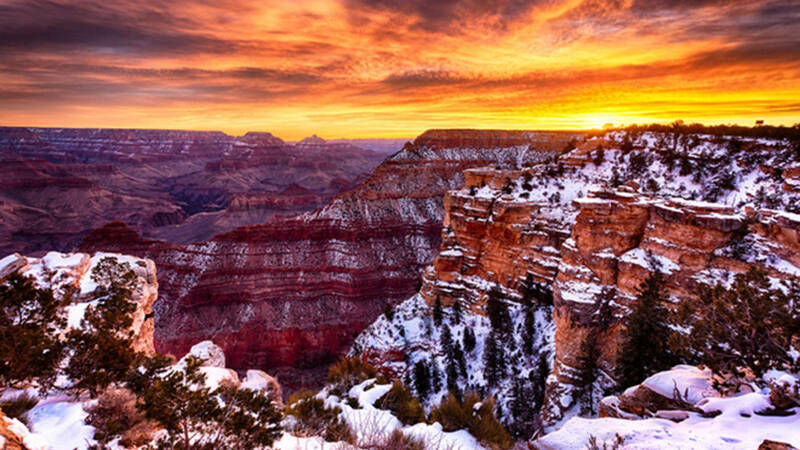 The Grand Canyon comes alive in the winter. You should make a point to see it up close and personal and by air.